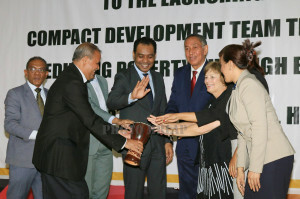 Timor-Leste’s Ministry for Legislative Reform and Parliamentary Affairs and The United States’ Millennium Challenge Corporation (MCC) this Monday, March 25, officially launched the Government of Timor-Leste Compact Development Team (CDT-TL), to lead the design and development of a program to address Timor-Leste's development challenges. The MCC and the Timor-Leste government have been working on the development of a five-year compact program to reduce poverty through economic growth. The MCC Board of Directors selected Timor-Leste for an MCC Compact in December 2017. The Presidente of the National Parliament, Arão Noé da Costa Amaral accepted the invitation to preside over the event and conveyed the support of the National Parliament. “The partnership’s goal of promoting economic growth concurs with the nation’s development priorities. Eventually will be necessary enabling legislation for the program and I am pleased to convey to you my support to these priorities and their implementation”, said the Speaker of the National Parliament. “On behalf of the National Parliament I also convey to Ambassador Kathleen Fitzpatrick and the people of the Unites States, our friends, our recognition for their support to the development of Timor-Leste”, added the Speaker. The Minister for Legislative Reform and Parliamentary Affairs affirmed the full State commitment to the MCC partnership. “The attendance by the Speaker of the National Parliament highlights the strong support of the State institutions. Ultimately, the success of this compact will depend on the commitment of all government departments and agencies”, said the Minister for Legislative Reform and Parliamentary Affairs. “Our country expects that this partnership with the United States’ MCC may represent a turning point in our effort to poverty reduction and development of better conditions for economic growth and job creation. It’s my firm conviction that we will achieve success in this endeavor”, added Minister Fidelis Magalhães. The event was also attended by the Minister for Education, Youth and Sports, Dulce de Jesus Soares, The Minister for Public Works, Salvador Soares dos Reis Pires, the Vice-Minister for Social Solidarity, Signi Chandrawati Verdial, members of the National Parliament, public administration high officials, the Diplomatic Corps, civil society, and the private sector. The National Executive Director of the Compact Development team, Ambassador Constâncio Pinto, said “the MCC program will strengthen conditions for economic growth and further deepen the relationship between the peoples and Governments of Timor-Leste and the United States and Timor-Leste”. During the compact development process, the CDT-TL will develop a program specifically aimed at addressing the country’s economic challenges, as jointly identified by Timor-Leste and the MCC. The compact development process includes an outreach component to engage with the civil society, the private sector, and development partners in Timor-Leste. Using a country-led approach that reflects a country’s own priorities, MCC provides time-limited grants and assistance to developing countries that meet rigorous standards for good governance, from fighting corruption to respecting democratic rights. Working with local partners, MCC tackles some of the most pressing challenges that developing countries face, like access to electricity, clean water, health, sanitation and human resources development. Minister Fidelis Magalhães closed his remarks by expressing his appreciation to the MCC team. “I salute our MCC partners and especially the MCC Country Team Leader for Timor-Leste, Hana Scheetz Freymiller, for their professionalism and dedication during the preparatory works. My best wishes to the National Executive Director, Ambassador Constâncio Pinto, and all the CD team in the exigent work of designing an effective compact for Timor-Leste. It is now the time. Let’s get to work”, he added.